Art can really set the tone for a space by making it feel moody, cheerful, or serene. We have a new mix of art pieces that will freshen up your home. They can even introduce new colors, feelings, or perspective to a space. If you are introducing art into your current decor or if you are starting from scratch, art is a fabulous place to start. For the next few ‘What’s New Wednesday’ posts, we will spotlight some of the new pieces we have in the store. If any piece catches your eye, don’t forget you have 7 days to try it out in your home. 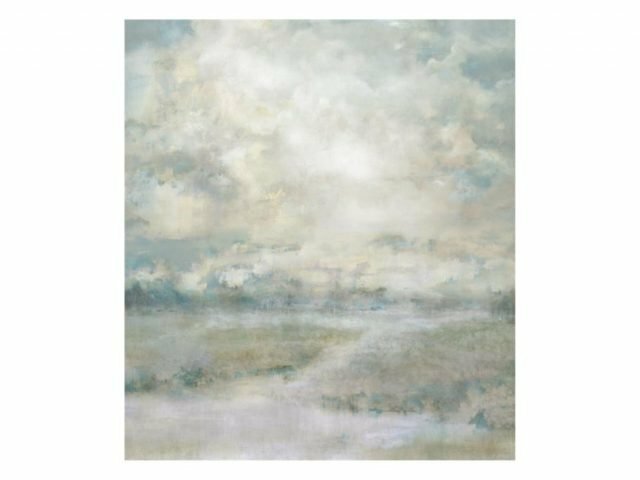 This week we will introduce you to a serene landscape piece with a peaceful mix of blues, sages, taupes, and greys. This piece, called ‘Awakening’, will pair beautifully with neutrals as the colors are soft and muted. We can picture it in a bedroom or any space that you want to transform into your own calm and serene oasis. This piece is 36″ W x 41″ H and sells for $449.99. ‘Awakening’ can be ordered in smaller and larger sizes. You can also custom order the piece with a frame. For custom inquiries, send us an email at info@heatherscotthome.com or call us at 512-342-6899. Our art can be shipped anywhere in the U.S.